The SPDR S&P 500 ETF (SPY) - the ETF that tracks the widely popular S&P 500 index - closed above its 200-day moving average on Tuesday. This is a widely followed trend indicator, and for good reasons. The data shows that making investment decisions based on such trend indicator can be remarkably effective at increasing returns and reducing downside risk. However, even if trend-following on a single index works well in the long term, it can substantially underperform over several years. Implementing a trend-following strategy on multiple markets, sectors, and industries can produce superior returns in terms of both risk and reward. 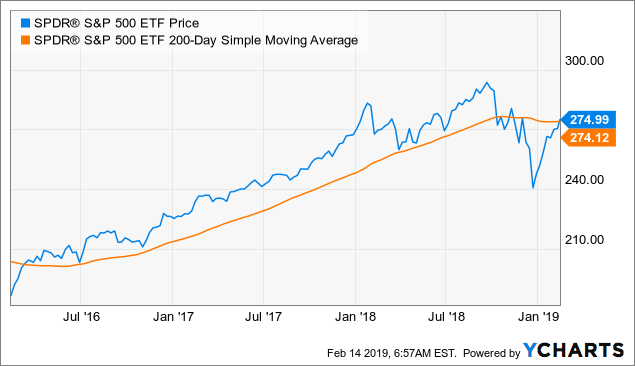 The following backtest is remarkably simple, it just buys the SPDR S&P 500 ETF when it's trading above the 200-day moving average (meaning that the ETF is un an uptrend). Conversely, if the ETF is below the 200-day moving average (meaning that it's in a downtrend) the strategy sells and goes to cash. The performance statistics are outstanding. Since December of 1999, the trend-following strategy more than doubled the buy and hold strategy in SPDR S&P 500. 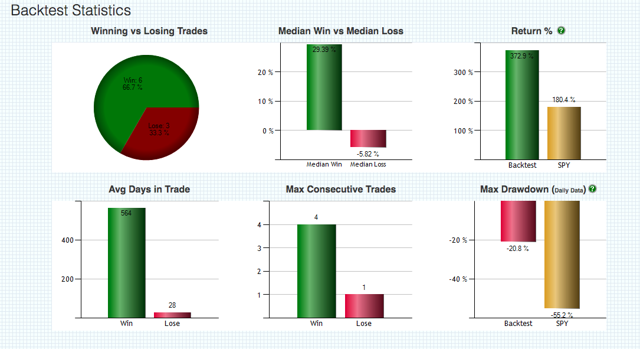 Trend following gained 372.9% versus 180.4% for buy and hold. Even more important, the maximum drawdown - meaning the greatest percentage drop in equity from the peak - was much lower. 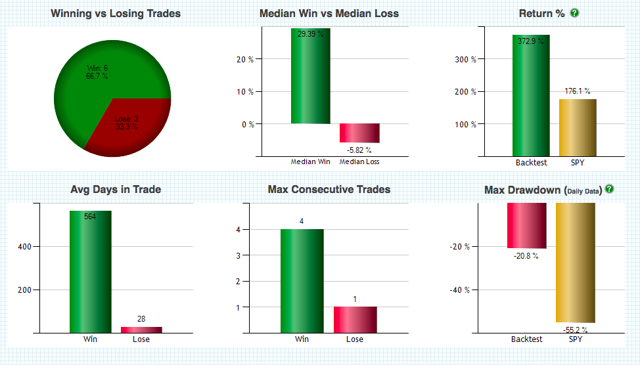 Trend following had a maximum drawdown of 20.8% versus 55.2% for buy and hold. Since the year 2000, trend following delivered more than double the return with substantially less than half the drawdown than buy and hold. However, it's important to acknowledge that the main reason for this spectacular outperformance is that the period under analysis includes two huge bear markets in 2001 and 2008. A trend-following strategy protects your capital when markets start falling, so it can make an enormous difference when markets go through severe drawdowns. have no positions in any stocks mentioned, and no plans to initiate any positions within the next 72 hours.